Butterfly Reflections, Ink. : You're Dog-awesome! I's franci ( fridayfinally ) here today to show you a cute interactive card feat. Avery Elle!! I looove it!! This cute little dog is soo pretty and sweet moving to his bowl and bones! I first die cut a stitched rectangle and a little heart out of some red cardstock, and a wonky stitched rectangle out of some white cardstock. I stamped all my images from the set " Furry Friends " with Memento Tuxedo Black Ink, i colored them with copics and i fussy cut them ( you can also use their coordinated dies to have a perfectly die cut image). I also added some white details with a white gelly roll pen. Then i started coloring my background, i used Tumbled Glass distress ink for the sky and some Shabby Shutters distress ink for the grass ( i also colored an additional strip of cardstock to create the grass that is showing through the die cut line!) . 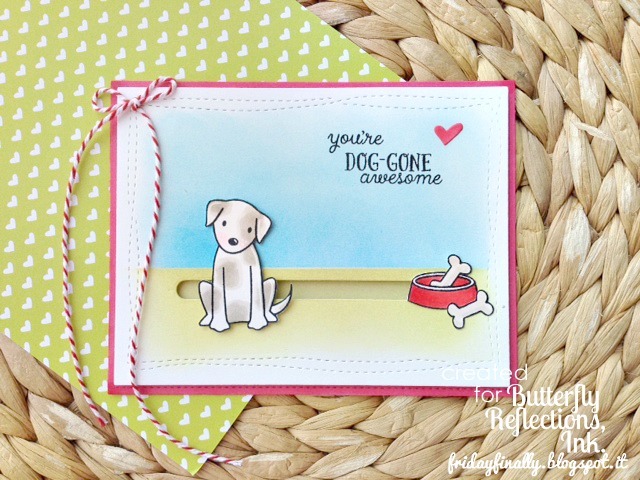 I use the Slide on over dies by lawn Fawn to make my card interactive and i glue down all my pieces. I stamped my sentiment with the same black ink used before, i glued also the little heart and i added some twine. Thank you so so much f or stopping by and have a lovely week! Super cute and so tender...!! !